Create deeper, richer, more lustrous colour as you cleanse. Formulated with cocoa and evening primrose oil, our Colour Deepening Shampoo cleanses and infuses deep brunette tones. Directions: Gently massage into wet hair, lather and rinse well. 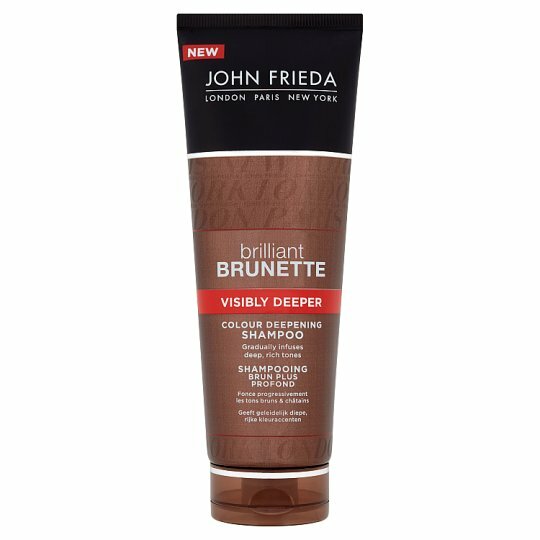 For dramatic colour, follow with Brilliant Brunette Visibly Deeper Colour Deepening Conditioner. For a boost of deep tones follow with the Colour Deepening Treatment as directed. Colour Depositing Safe for use on natural or colour-treated hair and for use on highlights & lowlights. CAUTION: Rinse hands immediately after use. Avoid contact with household surfaces to prevent staining. If contact occurs, clean immediately.